What Would Happen If Women Take Revenge? Rosalie Morales Kearns, a writer of Puerto Rican and Pennsylvania Dutch descent, is the founder of Shade Mountain Press, a new small press whose focus is literary fiction by women. In her latest novel, "Kingdom of Women," the main character is a female Roman Catholic priest. Women are still vastly underrepresented among authors of literary fiction. Only about 25% to 30% of authors published in literary journals are women. Of the authors whose books get reviewed in the major book review outlets, again, less than a third are women. Same situation in book publishing: whether is a big publishing or an independent one, at some publishers, the percentage of women authors of literary fiction is as small as 10%. I get all these data from the blog of Rosalie Morales Kearns, a publisher and writer of Puerto Rican and Pennsylvania Dutch descent, born and raised in Harrisburg, PA, and currently living in Albany, NY. Morales Kearns, who experienced in her own skin the difficulties of publishing a book as a women author, decided to find a solution, so she founded Shade Mountain Press, a small book publishing company, focused on literary fiction by women authors. Their first two titles were published in 2014. One of them was named a Best Book of 2015 by NPR; another was a semifinalist for the Thurber Prize. I happen to know that women are writing great things", she writes in her blog. "I want their voices to be heard. I especially want to read more works by women from groups historically underrepresented among literary authors: women of color; women with disabilities; women from working-class backgrounds; lesbian/bisexual/queer women". Graduated in Theology, with an MFA in Creative Writing, Morales Kearns is a woman author herself. In December 2017 she published Kingdom of Women (Jaded Ibis Press), selected as "book of the month" (May 2018) by Las Comadres para las Americas, a women organization based in Austin, TX, that"connects Latinas around the world through our love for literature". In Kingdom of Women, the author imagines a slightly alternate near-future, where women are forming vigilante groups to wreak vengeance on rapists, child abusers, and murderers of women. Averil Parnell, a female Catholic priest, faces a dilemma: per the Golden Rule she should advise forgiveness, but as the lone survivor of an infamous massacre of women seminarians, she understands their anger. Her life becomes more complicated when she embarks on an obsessive affair with a younger man and grapples with disturbing religious visions. She had wanted to be a scholar, before the trauma of the massacre. Later, all she wanted was a quiet life as a parish priest. But now she finds she has become a mystic, and a central figure in the social upheaval that's gathering momentum all over the world. 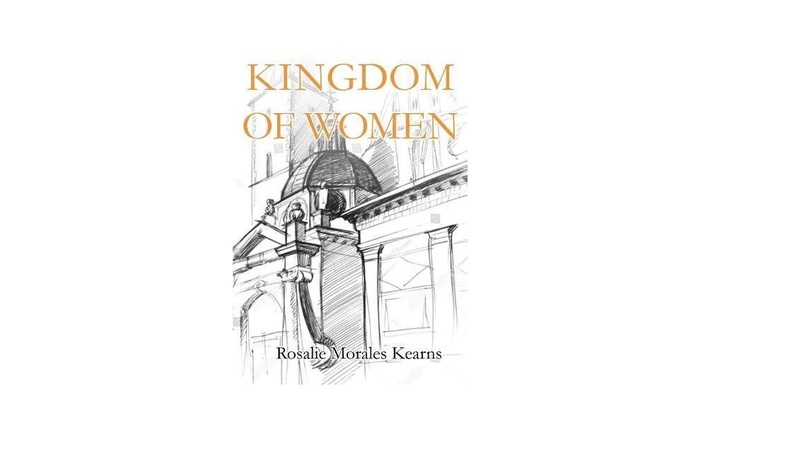 Kingdom of Women spans decades and delves into multiple points of view, not only highlighting the personal evolution of a complex, troubled individual but also exploring larger themes like the ethical implications of the use of violence against oppression, and the tension between justice and mercy, revenge and forgiveness. The connection between Morales Kearns and Pennsylvania has left a mark on her professional career as an editor and writer. Morales Kearns was born and raised in Harrisburg, PA, which is less than 60 miles away from Shade Mountain, the mountain ridge that inspired the name of her feminist publishing house, and a landscape that constantly appears in her work. Shade Mountain is part of the Bald Eagle forest park, where the author used to walk as a child. His father, of Dutch origin, was born in Beavertown, PA, a town of less than 1,000 inhabitants at the foot of the mountain ridge. "You can see Shade Mountain from pretty much anywhere in the town", she explains in her blog. Another thing that made Shade Mountain meaningful to her was the fact that her grandmother "would have looked at that mountain every day of her adult life. My father’s grandmother was born and raised there, and so was her mother, and so was her mother. I feel like I’m invoking my foremothers, and honoring them and this beautiful place". Her Puerto Rican roots are also very present: "When I was a kid, my mother loved to talk about the Puerto Rico she grew up in: life was better there, the people were friendlier, more genuine, the surroundings more beautiful. Pennsylvania was my home, but I also saw it through her eyes—as a foreign place. So I grew up with a sense that there’s somewhere else that’s better than here", she said in an interview with NBC News last December. Educated in a Catholic school, Morales Kearns graduated in Theology and earned an M.F.A in Creative Writing from the University of Illinois. She is currently teaching Fiction Writing at the New York State University in Albany and managing her publishing house. She is the author of the critically acclaimed story collection Virgins and Tricksters and the editor of the story anthology The Female Complaint: Tales of Unruly Women.